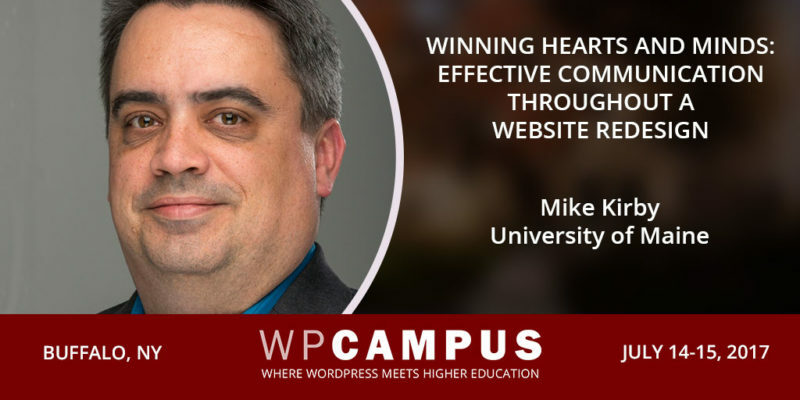 Mike Kirby will be joining us at WPCampus 2017 to speak on effective communication throughout a website redesign. You can see him in action on Saturday, July 15 at 11 a.m.
Tell us about your first website or digital project. What was the spark for you? My first website was the first website for TAPPI, the Technical Association for the Pulp and Paper Industry. You can see a snapshot of this site in all it’s mid-90’s glory at https://web.archive.org/web/19961124070424/http://www.tappi.org:80/. The spark was my interest in the Internet as the logical progression from regional BBSs (Bulletin Board Systems), which I was a hobbyist for in my teenage years running a dial-in bulletin board on my Apple IIc in the mid-80’s. Finding out how easy it was to craft compelling web pages with simple HTML markup was a new frontier, and I suddenly found myself with a career that hadn’t existed months earlier. I have always worked in the nonprofit space, first for TAPPI, then for The Jackson Laboratory (a mammalian genetics research facility) and now for the public University of Maine. I find that the nonprofits fit my personality well, and it is nice to work at a place where the pursuit of revenue is not the sole mission. Tell us about the topic of your session. Why is it important to you? Above all else the Internet is a communications channel, and successful projects demand good communications to succeed. In the many web projects I have found myself involved with, the successful ones shared a solid focus on communications, which fostered buy-in and participation from the stakeholders you need. Who do you follow on Twitter and why? I tend to follow public speakers I have had the opportunity to hear (@baratunde, @chrisbrogan), companies that I am passionate about (@criterion, @gameofkittens), and news organizations in my area (@TheMaineCampus, @umainenews, @bangordailynews). To be fair, I’m not a huge Twitter user but I recognize the value. Why do you ♥️ WPCampus? The Venn diagram where WordPress, Higher Education, and Communications coincide is where WPCampus thrives, and I want to be a part of this growing community. Attending the first conference in Sarasota gave me the motivation to break out of my comfort zone and start presenting rather than just attending, and I look forward to greater participation in this space. If someone designed a wapuu for you, what would it look like? My wapuu would be wearing a Skinny Puppy t-shirt, holding a vinyl record in one hand and a comic book in the other. Oh, and wearing a nice hat, of course. What WordPress, or other, tool can you not live without? I cannot live without a keyboard. The tactile sensation of putting words into the machine helps funnel creativity for me, and I miss the folding keyboards they used to make for palm pilots. Smartphone typing stinks, and is probably why I don’t tweet more.